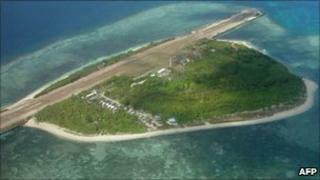 A group of Philippine politicians has visited a disputed island in the South China Sea, reigniting a row with China. The politicians landed on Pagasa island, the only island in the Spratlys chain populated by Filipinos, and sang the national anthem with residents. The island is also claimed by China, Taiwan and Vietnam as part of a wider dispute in the South China Sea. China has already said that the politicians' visit could harm relations between Beijing and Manila. Landing on Pagasa island, congressman Walden Bello said the visit was a historic moment and declared the island "Philippine territory". "We come in peace, we support a diplomatic solution. But let there be no doubt in any foreign power's mind that if they dare to eject us from Pagasa... Filipinos will not take that sitting down," he said. Before the trip, the Chinese embassy in Manila said it served no purpose "but to undermine peace and stability in the region and sabotage the China-Philippines relationship". The BBC's Kate McGeown in Manila says that while the two countries' governments are exchanging a war of words, the island's residents are getting on with their lives. Locals told reporters they often wave at their Chinese neighbours while out fishing, and even barter for cigarettes, our correspondent adds. Pagasa, also known as Tithu island, lies about 480km (300 miles) west of the western Philippine province of Palawan. It has an airstrip, a military base and a small town hall, and is occupied by about 60 civilians. Tension in the South China Sea has been ramped up this year, with frequent spats and diplomatic rows - particularly between Vietnam and China. The regional political bloc Asean (Association of South East Asian Nations) is currently meeting in Indonesia in a summit likely to be dominated by the South China Seas issue. Asean diplomats on Wednesday said they had reached an agreement with China on new guidelines aimed at solving the dispute. But analysts said the guidelines did nothing to solve the underlying tensions and did not tackle sovereignty issues directly. The Spratly Islands lie in an area thought to be rich in oil and gas. The region also has vital shipping routes.